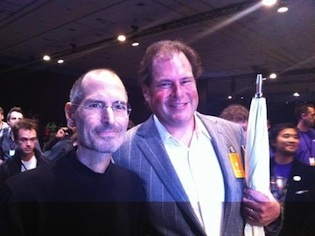 Usually Apple launches are all about new product, and the WWDC keynote by Steve Jobs and crew was no exception. IOS 5, OS/X Lion, and iCloud were the tech version of a triple play, mainlining the iPad into the Mac and virtualizing the two product lines via the Cloud. What this means for Apple’s competitors is being debated right now, particularly in Redmond and the GooglePlex. But The Company Formerly Known as Don’t Be Evil has its work cut out for it, with little room for error. 1. iCloud Match is the strategy Google failed to adopt with Buzz. Instead of shoving it down our Gmail throats, Apple encourages us to move online with iTunes knowing that liner notes will quickly expand the music business into the publishing business. Although the 256k quality does not replace CDs, it does meet the same threshold some of us use to rip music off disk. Match implies an upgrade to better quality if Amazon or a Hulu-like Gang of Four emerges with a competitive offer. And what happens when Apple Matches the Android Marketplace for a yearly subscription? 2. Documents in the iCloud directly attacks Google Docs with everything but collaborative editing in a richer UI that feels more directly competitive with Office. Notice the heavy pounding on APIs at the event; developers will think twice about feeding productivity development to Google when the richest market (iPad and the AppStore) is ceded to iOS at the very moment OS/X is merging into the iPad OS. It’s a kind of reverse Microsoft strategy where you write to Windows and it cascades down through to Xbox and mobile. Build iOffice on the iPad and port it to what’s left of the desktop. 3. Notifications, iMessages, FaceTime, and AppleTV represent a formidable infrastructure play that could push out Skype and bleed the carriers dry of high margin SMS and voice services. Apple TV may seem like an outlier, but what happens when the only big hits like The Voice become online advertising and location-based auction vehicles for Twitter and notification-friendly interApps? Android will have to come off its phony open stance and interoperate, or be shut out of the new studio model that will emerge over a remarkably short period of time. 4. You may have noticed Twitter is now turbo-charging @mentions by sending an email notification when someone you follow @mentions. This tends to filter out those who are trying to game the social cloud, while establishing a corollary to the notifications router being released in iOS 5. The analytics around such messaging will produce more elaborate filters, and third parties will mine the data and resell it to marketers. Another reason why Google has to wrap its arms around the model rather than waste time pushing Flash out as a differentiator. 5. Notice how Facebook is missing from these and many other words we’re hearing these days. The iOS/iCloud/Twitter integration suggests why Apple and Facebook ran aground on Ping, but iMatch will really head Facebook off once it migrates from music to TV. It’s already working with apps, which means publishers like the New York Times who integrate video and AirPlay will have an interesting subscription-based hybrid magazine/record/broadcast model unencumbered by the cable and satellite crowd. Paging Netflix. 6. After all, who is to say that all iMatch is about is checksums on music files. If Apple can sell a subscription for 30 bucks a year to consolidate your music, it could also aggregate a best of cable news, sports, and events and outbid or partner with a Netflix to leapfrog Comcast. Use the Twitter @mention signals to define and sell direct to those high value customers, and turn around and buy the programming from the studios. And most importantly, create the programming themselves, as in launching the new record business to finance the new television and film business. Where is Microsoft in all this? Investors and customers are asking the same questions. The House That Bill Built may be in worst shape than even the Ballmer pushers suggest. If iOffice gets traction with the social crowd, it will put pressure on @SteveSinofsky just as he assumes control of a two screens and a hail Mary strategy. Developers hold the cards, and the AppStore beckons. Android blocks Windows Phone from accelerating, and iCloud keeps the media pinned down. Right now it looks like Game, Set, iMatch.